Inhale. Exhale. Breathe. Breathe. Breathe . . . The world is dead. 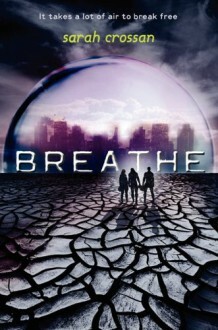 The survivors live under the protection of Breathe, the corporation that found a way to manufacture oxygen–rich air. Alina has been stealing for a long time. She's a little jittery, but not terrified. All she knows is that she's never been caught before. If she's careful, it'll be easy. If she's careful. Quinn should be worried about Alina and a bit afraid for himself, too, but even though this is dangerous, it's also the most interesting thing to happen to him in ages. It isn't every day that the girl of your dreams asks you to rescue her. Bea wants to tell him that none of this is fair; they'd planned a trip together, the two of them, and she'd hoped he'd discover her out here, not another girl. And as they walk into the Outlands with two days' worth of oxygen in their tanks, everything they believe will be shattered. Will they be able to make it back? Will they want to?